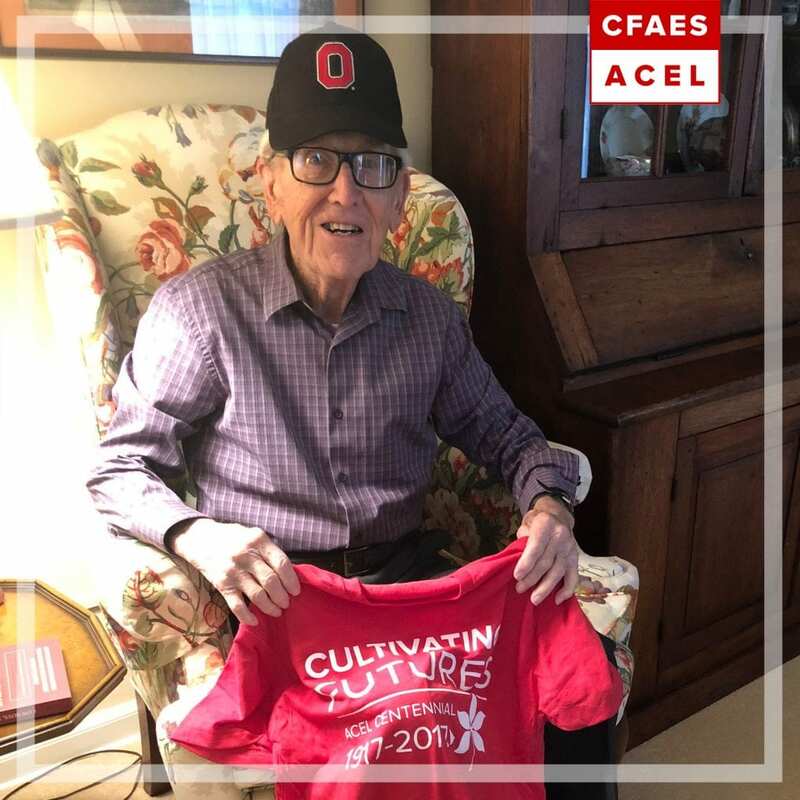 Kristen Reymann, assistant director of leadership annual giving with the Ohio State Alumni Association, recently visited agricultural education alum John Feisley in honor of his 100th birthday. Feisley graduated in 1941 with a bachelor of science in agricultural education. Reymann shares about her visit with him below! I recently had the pleasure of executing a special mission from the College of Food, Agriculture, and Environmental Sciences. Claire Badger and Kyle Sebastian reached out to me with a plan to deliver a very special 100th birthday present to a 1941 OSU agricultural education alumnus in eastern Ohio. Claire gave me the package, I made a phone call, and I was off to Saint Clairsville the Wednesday before Thanksgiving. When I arrived at John Feisley’s house, I was greeted with a big smile and was immediately welcomed inside. I presented the gift and gave him kind words from the college as he opened his new goody bag. I don’t think the smile left John’s face the whole hour that I was there. He enjoyed the OSU hat and shirt, and intently read the pamphlet from CFAES as he opened up his birthday card from Dean Kress. I informed him the coin that he received from her is rarely handed out and he giggled as he held it in his hands. He also received a personally addressed video from the Chair of the Department of Agricultural Communication, Education, and Leadership (ACEL) which is where John’s major is housed. This department just celebrated their 100th birthday last year. What a happy coincidence! John’s happy personality was contagious as we talked about Ohio State memories and shared stories about campus. I asked him what his favorite memory was from OSU and after a short pause he quickly said “well the football games of course”. He still remembers the first game he ever went to. His sister had bought him a ticket to the OSU vs. TCU game and even though the Buckeyes lost that day, he still enjoyed his time in The Shoe. “They beat us. But then we went down to the field and tore the poles down. You would think we only did that when we won!” John still watches every game to this day. John grew up with two brothers and one sister in Clarington on the Ohio River where his father was a dairy farmer. His grandfather came to the United States from Switzerland when he was 12, and John remembers life back in the day when a horse and buggy was the main way of transportation. He recalls the change from this to gravel roads and cars during the winter, and laughs thinking about how muddy it used to be. John received a scholarship while he was at Ohio State which covered the full $200/quarter tuition. He says “it was kind of a quiet university at that time” with about 19,000 students. He remembers Dr. Ralph Bender, who assisted in the practice teaching program in Westerville high schools, although he completed his in Grove City with Mr. Ruble. He enjoyed attending basketball games with his friends and dance classes in the old Ohio Union. He and his classmates all donated $1 to help build stone walls near the university’s entrance on 15th avenue. He still remembers the library, University Hall, and Townsend, and just recently visited last summer. I asked John about his wife Marian, who passed away 4 years ago. He told me they met at a movie theatre and even though she went to the University of Cincinnati, they were still Buckeyes. He chuckled as he told me about the times when they would go back and visit UC. “She couldn’t find anything and she was always disoriented”, he laughed. John told me his daughter Anne, also an OSU alum (‘97), was coming from Columbus to spend time with him on Thanksgiving. He shared a few stories about his children and his Christmas Tree business before I packed up my things to head back to Columbus. We took some pictures together, said our goodbyes, and I left with a full heart and another great Buckeye memory. Happy 100th birthday John! Happy Birthday John! We are so proud to have you as a member of our alumni family! 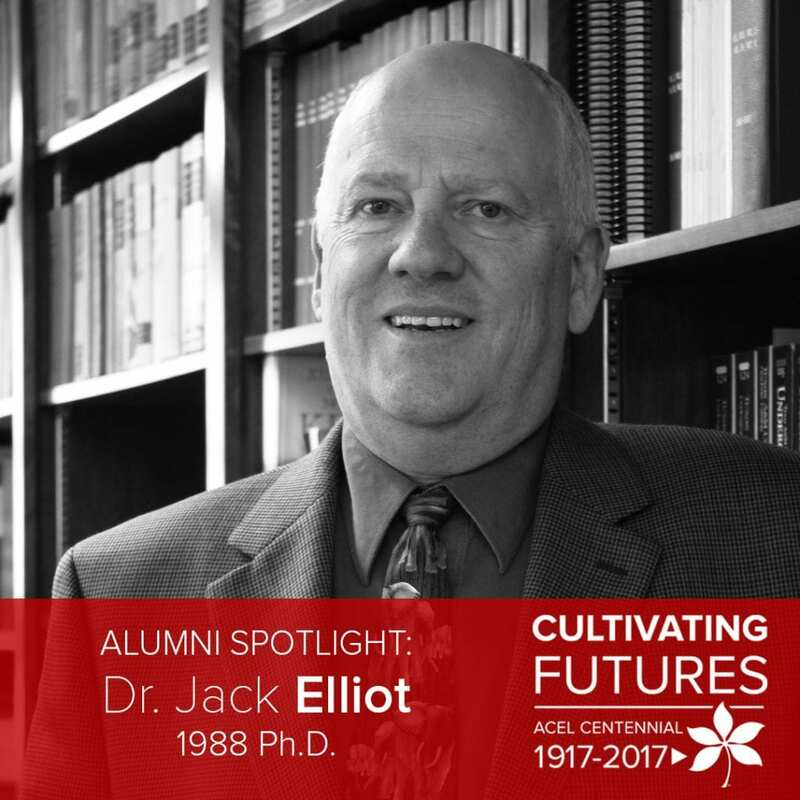 Alumni Spotlight: Dr. Jack Elliot ’88 Ph.D.
Dr. Jack Elliot received his Ph.D. from Ohio State in 1988. Following faculty positions at Michigan State University and the University of Arizona, Elliot is now a professor and endowed chair for International Agricultural and Extension Education at Texas A&M University. [ACEL]: Hello Dr. Elliot! Why did you decide to get a doctoral degree in agricultural education? [Elliot]: During my high school agricultural education teaching career, I experienced some very memorable and exciting interactions with students, administrators, and community members. 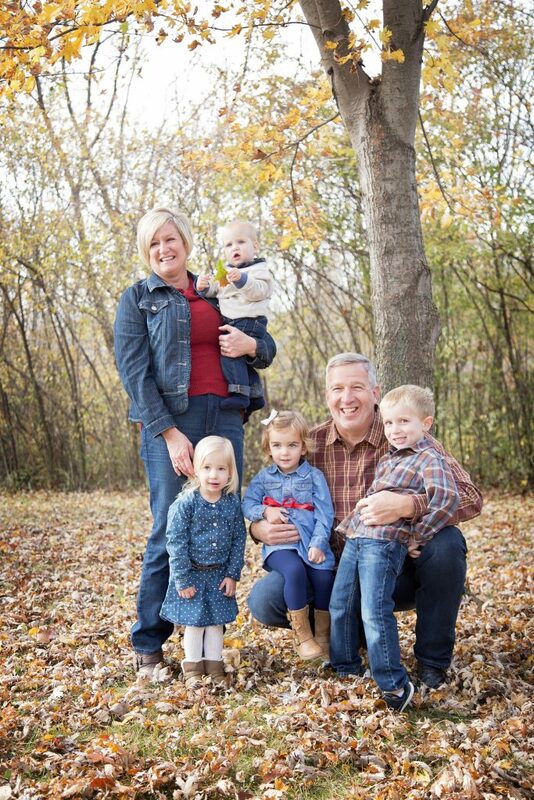 My wife and I decided to further my education with a Ph.D. in agricultural education so I could work with others to improve the profession at every level, junior high, senior high, and postsecondary. My wife and I attended the National FFA Convention in 1985 and visited many of the university booths at the career show. When we asked for a list of the top three graduate programs, The Ohio State University was the only university on everyone’s list. How did your education at Ohio State influence your choice of career? I admired the Ohio State faculty because of their professionalism and involvement within field. They served as my role models during my entire career. I was inducted within the Gamma Sigma Delta, International Honor Society of Agriculture. 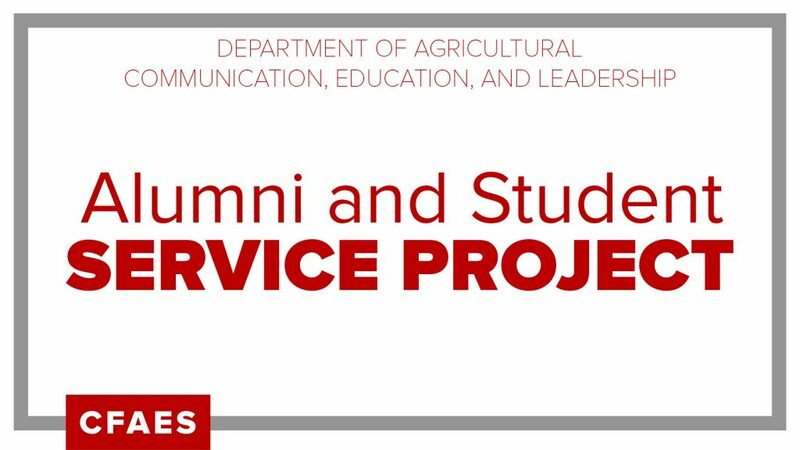 During my final year at Ohio State, I was president of the Agricultural Education Graduate Student Organization. 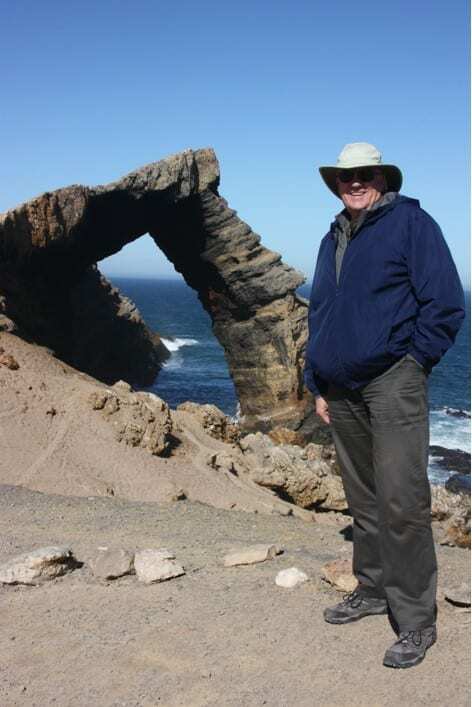 Dr. Dave McCracken taught one of the “research series” courses and I enjoyed his teaching style, the way he assessed student knowledge, and his humor. In addition to Dr. McCracken, most of the faculty had positive impacts on my career. However, I did have a difficult time one spring, a medical situation. Dr. L.H. Newcomb provided some gentle support and guidance. I always remembered his sincerity and concern and have tried to emulate that attribute in my career. Our family visited many of the presidential sites within the state. We love history and wanted to create memories for our children who were 4 and 9 when we arrived in Columbus. There were very few tenure track positions in 1988 when I graduated. A one-year visiting assistant professor position at Michigan State University was available and they hired me. I was able to stay for four years because other opportunities presented themselves which provided funding so I could stay. For what schools have you worked throughout your career? 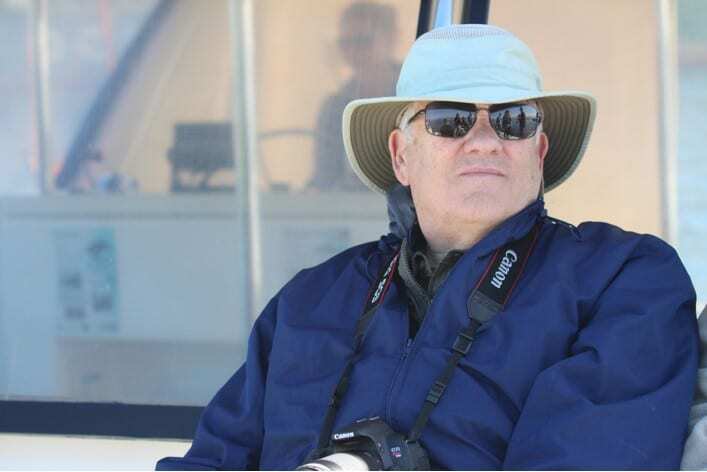 After Michigan State, I had a 17 year career at the University of Arizona where I moved through the ranks to professor and became the department chair the final three years before I moved to Texas A&M. Share with us any awards or honors you have received throughout your career. I love watching former students succeed. For example, Samantha Alvis recently completed her Ph.D. and is now the Higher Education Officer at USAID. Dr. Newcomb told me that 95% of what you will face after you leave Ohio State will not be covered by the courses you completed, but the 5% will provide the foundation so you can address and handle almost any situation. That advice is still relevant today. The most important attribute is a sense of professionalism. Always take the higher ground and treat others as you would like to be treated. Alumni Spotlight: Dr. Elizabeth (Liz) Smith, ’17 Ph.D.
Dr. Elizabeth (Liz) Smith earned a doctorate in agricultural and extension education in 2017. Following her completion of the program, she moved to Manchester, Tennessee, where she works as an assistant professor at Middle Tennessee State University. [ACEL]: Hi Dr. Smith! You completed your Ph.D. in agricultural and extension education. Why did you make that decision? 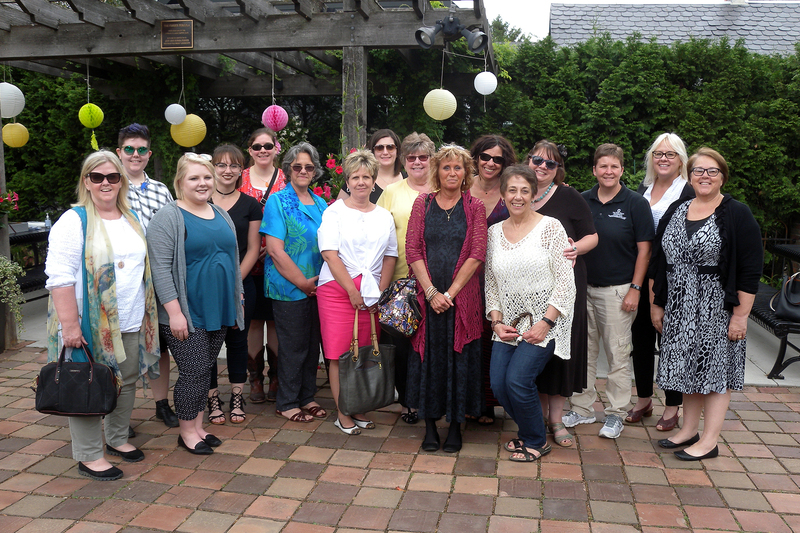 After talking with other respected Extension professionals I was guided toward ACEL. I was already working for Ohio State as a regional specialist at the time of enrollment. I enjoyed classes and many of the faculty that facilitated the courses in which I was enrolled. I felt like teaching and working with young adults would be something I would enjoy. I love to learn and knew teaching would allow me to continue learning. I enjoyed the leadership course and the study abroad to Honduras. I also enjoyed the public health courses I took. What professor, faculty or staff member had an impact on your education? I respected and enjoyed many of the faculty at Ohio State. Dr. Jamie Cano, Dr. Filson, Dr. King, Dr. Gail Kaye, Dr. Sherer, and Dr. Wittington. I enjoyed their passion and advice regarding career and living life to the fullest. My study abroad trip to Honduras. Assistant Professor at Middle Tennessee State University. I teach senior level medical nutrition therapy, coaching and counseling, community nutrition, and nutrition education. How are you involved in your community outside of your career? I serve as a judge for 4-H projects and am involved in my church. We had a 95% internship match rate for our dietetic students this year. Very proud of the students and all of their hard work. Participate in a study abroad – you will learn so much about your self while giving back to others. Follow your dreams and love what you do. I absolutely love teaching- the students, faculty and staff are wonderful to work alongside day by day. Encourage others to reach their potential, never give up your dreams. Dr. Cano presenting my hood at my commencement ceremony in May 2017. My farewell party from the OSU Extension office. [ACEL]: Hi Rose! Why did you choose to major in agricultural education? [Smith]: I knew I wanted to be involved in informal agricultural education, educating the general public about where their food comes from. I didn’t know if that meant working in the United States or overseas, but I did know that majoring in agricultural education would prepare me best for my future career. It’s the best! My high school guidance counselor encouraged me attend Ohio State knowing I wanted to teach agriculture, but not necessarily in the classroom. I attended classes at OSU-Lima for the first two years of my education, as they were offering evening classes locally in Bellefontaine. This was perfect as it allowed me to work full time during the day and attend small classes in the evening. Once it was time to focus on my major, it was an easy transition to main campus. My education at Ohio State opened my eyes to what a huge need there is for educating consumers on the food supply and food systems. I have worked in the organic industry for over six years now and the desire for people to know how their food is raised is higher now than ever before. My favorite job was working at the RPAC. It had just opened when I began working there. It was a fantastic opportunity to meet such a diverse group of students and I still run into my former boss on a regular basis, mainly when tailgating before football games! I really enjoyed the “Block” set up, spending large chunks of time with some of my closest college friends, knowing we were all working on the same thing was interesting. Some of my other favorite classroom memories happened because my brother and I had the same major, and he was only a few quarters ahead of me, so occasionally we would have classes together. Those classes were always more challenging because we were fairly competitive with each other on anything where there could be the slightest bit of competition, so I would always try a little harder in those classes. He would also make me buy the book, saying we would “share it”… I never saw those books again. What professor, faculty or staff member had an impact on your education/career? There are a few that stand out, but Dr. Susie Whittington probably made the largest impact on me. She has a super power of knowing the special skills of each student and where they would fit best once leaving college. She has the great ability of encouraging students just when they need it most and nudging them in the right direction. She was a big part of me getting my first job after college. Just recently, I was visiting with her at a wedding, discussing women doing jobs that historically were held my men. Though I already knew it, it was an amazing reminder of what a trail blazer she is, leading the way for woman to teach agriculture in a variety of formats. What a hard question! There are so many, but one that is coming to mind is the 2002 Ohio State vs. Michigan Game. The game was obviously amazing and unbelievable. Digital cameras weren’t in full swing yet, and everyone was still using film cameras. I remember walking to the CVS on the corner of High and Lane to drop my film off the next day and there was a pile of film several feet tall that had been turned in to be developed. The girl behind the counter looked at me, with this look of panic on her face and firmly said, “It’s going to be a longer than an hour”. It was just the reminder of what a historic this had happened the day before. It was exciting being a part of it. I worked as an Outreach Educator at COSI. I traveled to elementary schools putting on an assembly of a specific topic, then spent the rest of the day working with smaller classes doing hands on science experiments. The most valuable thing I got from working there was a strong ability to be independent. It was me and a box truck full of science equipment traveling all over Ohio and the surrounding states. Plus, who wouldn’t love a job where it was normal to shoot off a rocket any given day? After COSI, I worked for just about a year at FFA Camp Muskingum. A job opportunity became available working in the organic industry in Bellefontaine, so I moved back home. I worked for two different organic certification agencies, Global Organic Alliance and Ohio Ecological Food and Farm Association, before landing what has become my dream job at Organic Valley. As a regional pool manager, I work with a dairy farmers that are currently organic and shipping milk with Organic Valley, as well as the farmers that are in transition to organic production. Organic Valley is a farmer-owned cooperative, and it is an honor to work with organic farmers who are working hard to keep their families farming by producing organic products. During your career, have you received any awards or honors? It isn’t an official award or honor, but I am the first female regional pool manager that works remotely for Organic Valley. Since I was hired there have been three additional women hired. There was a lot of discussion on how farmers would handle having a woman as their manager, but it has turned out just fine. I had been working at Organic Valley for about a month when I stopped at a farm to take a farmer out to lunch. While we were eating he said, “You know this is no job for a woman”. I had no idea how to respond. Since then, I have formed a great relationship with him and he has actually told me, “They hired the right woman for this job”, which is a huge complement. I love being able to offer farmers a market for their milk. I remember one spring day about two years ago, when I was going through the contract we complete with farmers when they join the co-op. The sun was shining and it was a beautiful day, so we sat at the picnic table in his yard and completed the paperwork. I will never forget the happiness the farmer was showing, as this meant he could be a full time farmer and no longer needed to work at his factory job. Though there are really tough parts of this job, it is always a highlight when I get to offer a contact to a farmer! Pay attention in class! There have been so many times that I need to do something in my current career, and I remember vaguely some teacher talking about this sometime in college, but I wasn’t really paying close attention. My life would be a lot easier now if I wasn’t going back to relearn all of those things. A perfect example, I remember mildly paying attention when we learned about calculating dry matter in a feed ration, thinking I would never need to know how to do this. I calculate dry matter for farmers almost weekly now. I should have paid attention. My professors knew I had no intention of teaching in the classroom, but knew that the skills taught in the agricultural education major would be incredibly useful in informal education as well. This showed me that education isn’t a cookie cutter approach and that education is about life skills and not just grades on a paper. Amy Miller is currently a State NFIP Coordinator in Nashville, Tennessee. 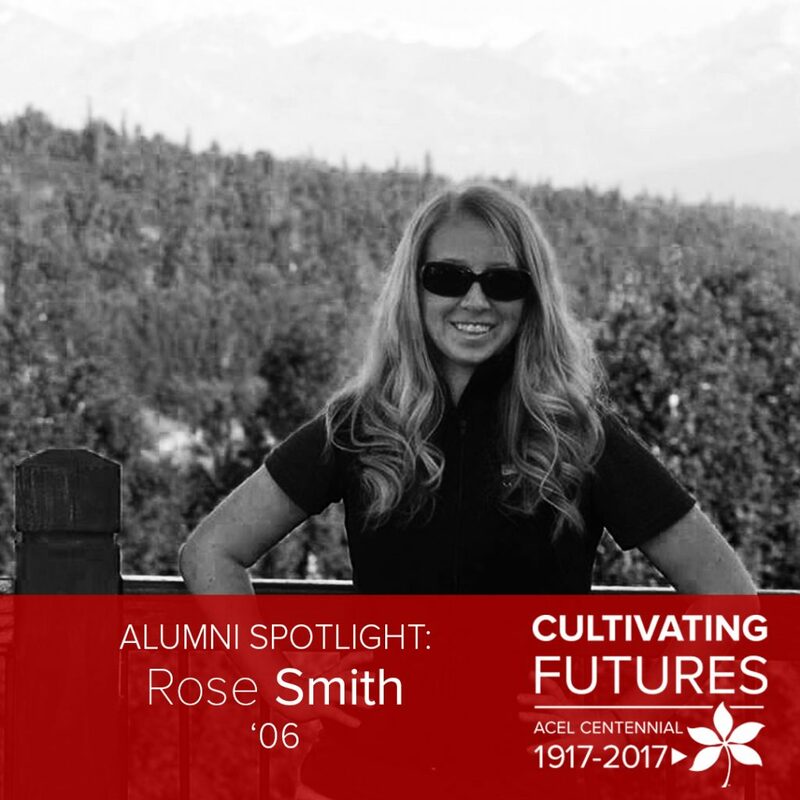 She graduated in 1999 with her bachelors in agricultural education. [ACEL]: Why did you select your major or graduate program? [Miller]: I’m a little bit country and a little bit rock-n-roll. My undergraduate degree is in Agricultural Education and my graduate degree is in City and Regional Planning. My programs were selected because I enjoy working on complex issues, finding solutions and improving the quality of life for citizens. I chose to attend The Ohio State University due to the friendly atmosphere that permeates throughout campus, the plethora of quality academic curriculum that will endure throughout one’s college and professional career, and the outstanding football program. My degree in Agricultural Education influenced my career path to work with various stakeholders regarding the preservation of agriculture. My studies enabled me to take a complex issue and simplify into a message regarding the value of agriculture on the community. I was involved in Campus Crusade for Christ, Collegiate 4-H, and City and Regional Planning Student Association. I enjoyed my City and Regional Planning classes. My favorite was Planning Places with People in Mind. This class focuses on the relationship between the built environment and humans and the importance of environmental design geared towards its inhabitants. 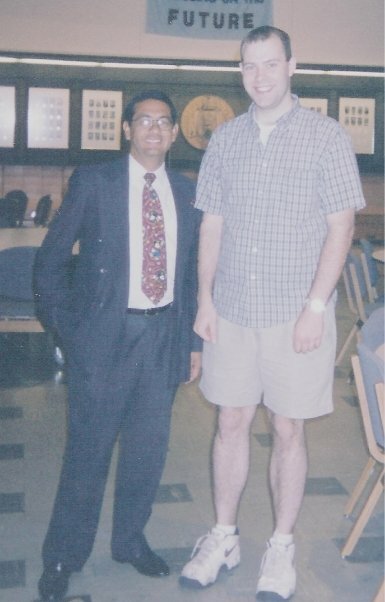 Dr. Scott Scheer had the biggest impact on my education and career while a student at The Ohio State University. He was authentic, approachable, trustworthy and fun. Whenever I needed to talk to someone, he was always there to listen and offer advice. My favorite memory was Ohio State beating the TTUN and rushing the field in 1998 to celebrate the victory. My first job was the Farmland Preservation Coordinator at the Wayne County Planning Department. For what schools, companies and/or organizations have you worked throughout your career and what were your responsibilities in those positions? My first job was Wayne County Ohio, Farmland Preservation Coordinator working with landowners to permanently preserve farmland throughout the county. After moving to Nashville, Tennessee, I worked for the Local Planning Assistance Office as a Regional Planner assisting 6 communities with development proposals and enforcing subdivision and zoning regulations. After this experience, I worked as a Budget Analyst for the State of Tennessee analyzing budgets for various agencies in regards to revenue and expenditure forecasts. My current job is the State of Tennessee National Flood Insurance Program Coordinator. I support 400 communities with floodplain regulation interpretation, enforcement issues and statewide training. During my career, I coordinated 62 grant applications from Wayne County landowners in 2002, for the Ohio Agricultural Easement Purchase Program which was the most in the state and was a tremendous honor to work with each applicant. In addition, I worked with Rails to Trails of Wayne County to secure an ODOT grant of $2.1 million to construction a 6.75 mile rails-to-trails project. Under my leadership, Tennessee became the 2nd in the nation to initiate the Certified Floodplain Surveyor program, certifying surveyors in FEMA Elevation Certificate preparation and Letter of Map Changes. Outside of your career, are you involved in any organizations or activities in your community? I am a volunteer at the Tennessee Prison for Women. My favorite career highlight was in 2001, attempting a 0.25% sales tax increase to fund a local Purchase of Development Rights Program in Wayne County, Ohio. The program would allow farmers to voluntarily sell an agricultural easement on their property and have the land remain in agricultural production in perpetuity. Although the initiative failed, we had a great public awareness campaign and continued interest in preserving local farmland that exists today. What you do will not get you up in the morning. Why you do it is what will keep you going. Emotion is the key. The Department of Agricultural Communication, Education and Leadership cultivated in me adaptability. Whether in my career or life, I have to have flexibility in handling change, being able to juggle multiple demands and adapt to new ideas with innovative approaches. All alumni and current students of our department are invited to come together to serve our community on April 14, 2018 from 10am-12pm. More details are available on the event page. We can’t wait to see you and serve our community together. 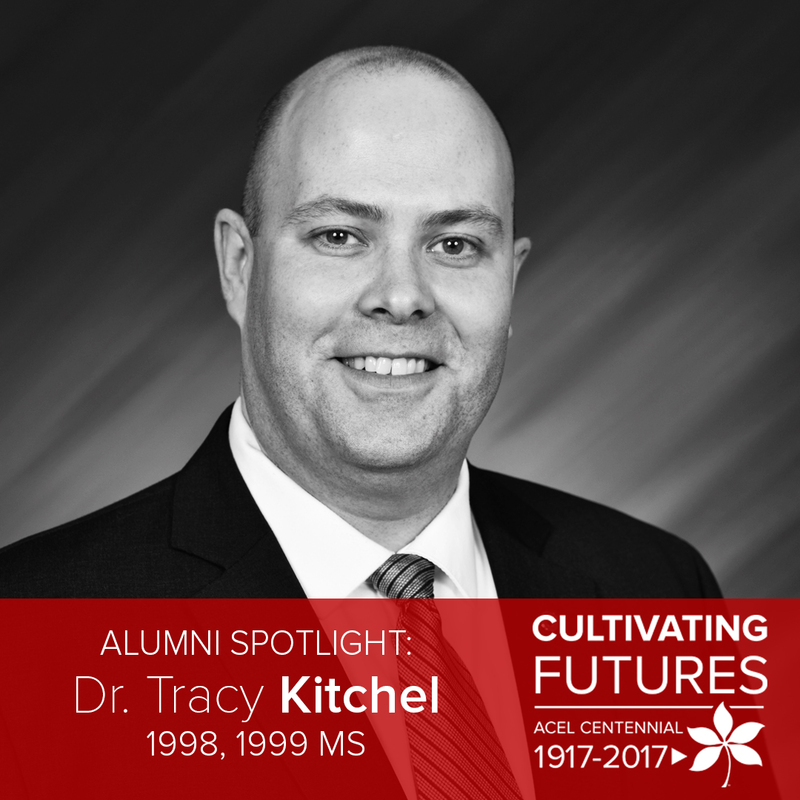 Dr. Tracy Kitchel graduated from Ohio State with his undergraduate degree in agricultural education in 1998 and his masters in agricultural education in 1999. Shortly after graduation, he became an agricultural educator and FFA advisor for Archbold High School in Fulton County. 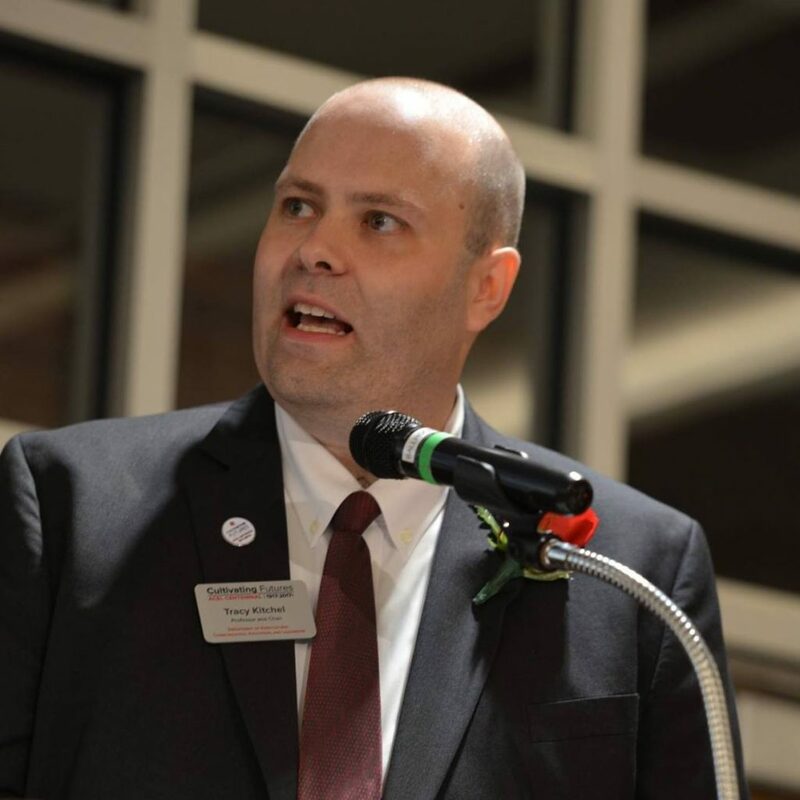 These days, Kitchel is a professor and chair for the Department of Agricultural Communication, Education and Leadership (ACEL) at the Ohio State University. 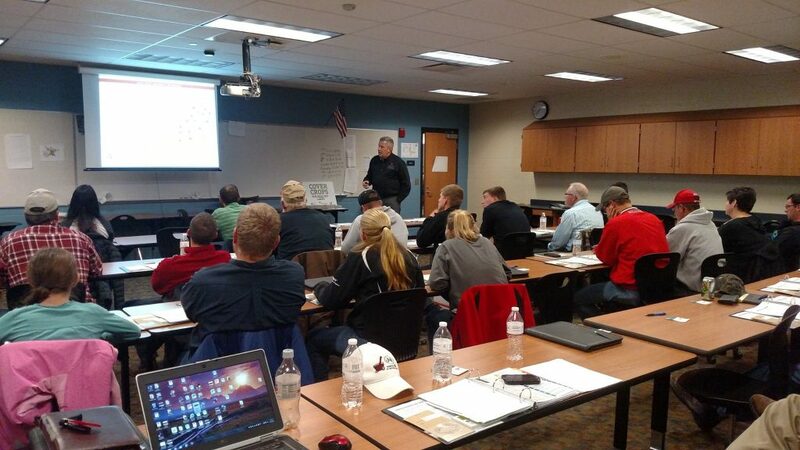 [Kitchel]: I started my undergraduate career as an agricultural communication major. I was drawn to that work because I had recently been elected as the State FFA Reporter, which, at the time, meant I was working with our magazine, Ohio FFA News. Throughout the year, however, I was drawn to working with FFA members and found it rewarding. The decision to change my major was solidified when I worked at the past state FFA officer session at Ohio FFA Camp; I knew I wanted to work with students. I’m not certain I thought of any other place. I knew I wanted to be in agriculture and I felt attending Ohio State was the clear choice. Even though I had been on campus for various reasons, I didn’t even do an official campus visit (something I don’t recommend, but it worked out for me). I wouldn’t be on this path had it not been for Ohio State. In particular, it was with my advisor, Dr. Jamie Cano, who insisted I do a literature review as an undergraduate, which would lead to my master’s thesis the following year. He planted the seeds that I needed to get my Ph.D. and be a professor. He assigned a student teacher for me to serve as cooperating teacher because he felt that experience would be invaluable as a teacher educator (and it was). 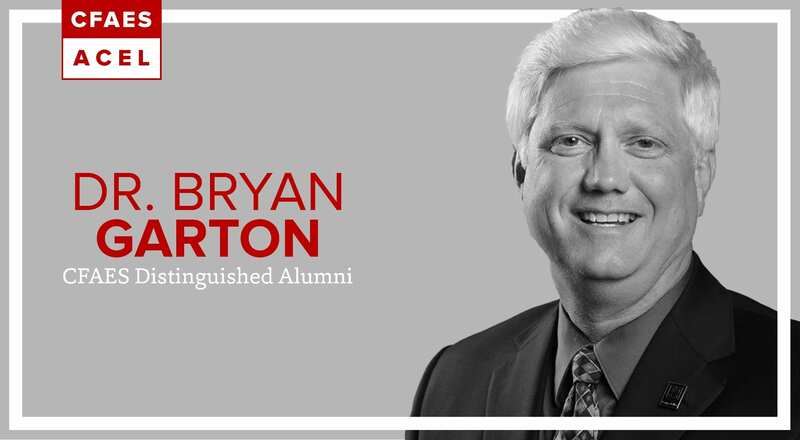 He connected me with one of his former Ph.D. students, Dr. Bryan Garton, which led to me studying at the University of Missouri for my Ph.D. I was president, secretary and banquet co-chair of Agricultural Education Society, a member of Alpha Tau Zeta (now FarmHouse) fraternity, president of Phalanx (the college student organization that soon-after morphed into the CFAES Ambassadors), and served as co-chair and narrator of the College Recognition Banquet. On campus, I worked as a Night Assistant in the Scott/Norton House Dorms and worked for the Ag Safety program in what is now FABE department. Off campus, I was an Ohio FFA intern, worked at Ohio FFA Camp two summers, and served as an office page for the Ohio Senate. I did my early field experience and student teaching both at Versailles High School with Dena Wuebker. My favorite courses were my ag comm and ag ed classes. I still use what I learned from Dr. Paulson’s AGRCOMM 200 and 300 courses today. My teacher preparation courses were great. I felt prepared as a teacher because of them. For the most part, there was a cohort of us that progressed through to student teaching. We laughed a great deal over the years. Our teaching labs were particularly comical, yet did a great job preparing us for the realities of teaching. As I shared before, Dr. Jamie Cano had the most impact on my career. I also appreciate the patience Dr. Jan Henderson afforded me, even when I didn’t always deserve said patience. It’s that kind of grace I’ve attempted to share with my own students even when said grace is not easy to give. I also appreciated how deeply intentional Dr. Hedges was in his teaching. That intentionality is something I always strive toward in my own teaching. I have so many great memories. I developed a great group of friends (time and change has surely shown…). We all bonded over football games – I still get emotional when I go to the games. Again, we had great times as a student teaching cohort. I really enjoyed student organizations and be a part of campus. I could go on and on. After graduating with my B.S. in ag ed, I started my M.S. in ag ed and was a graduate associate for AGRCOMM 390 (now 3130). After that, my first “out of college” job was as agriculture teacher and FFA advisor for Archbold High School in Fulton County (Ohio). What positions have you held since graduating and where have you worked? I moved around a bit over my 18 years after leaving Ohio State. After being an ag teacher at Archbold High School. I was a graduate assistant and Ph.D. student at the University of Missouri. After graduating, my first faculty position was as an assistant professor at the University of Kentucky (UK). I left UK after 5 years and became associate professor and director of graduate studies for the Department of Agricultural Education and Leadership at the University of Missouri (MU). At the end of my time at MU, I served as assistant vice provost for graduate and postdoctoral affairs where I served as the secondary leader for the Office of Graduate Studies (other places called the Graduate School). In particular, l was in charge of areas and programs such as campus fellowships, student-faculty issues, the campus TA training and development of our directors of graduate studies. In August 2016, I returned to Ohio State to be Professor and Chair of ACEL. I’ve spent most of my career in higher education and in those professor roles, have taught courses from teaching methods, research methods and introduction to leadership. I’ve conducted research on pre-service and early career agriculture teachers. Finally, I provide service in working related to agricultural education, agriculture teachers and FFA. Some of my more meaningful awards include the USDA Excellence in Teaching Award (Early Career Award), North Central AAAE Distinguished Teacher and Distinguished Researcher Awards, Gold Chalk Award (University of Missouri) for excellence in graduate teaching, Joe T. Davis Outstanding Advisor (University of Kentucky’s College of Agriculture), OAAE Outstanding Young Ag Teacher Award, Honorary American FFA Degree and CFAES Alumni Young Professional Award. In a truly authentic way, my favorite career highlight was the opportunity to return to my home department and serve as its chair. Up there on the list, in a far less serious way, is having presided over the master’s degree ceremonies at the University of Missouri when I was Assistant Vice Provost. I have to admit – that was cool. 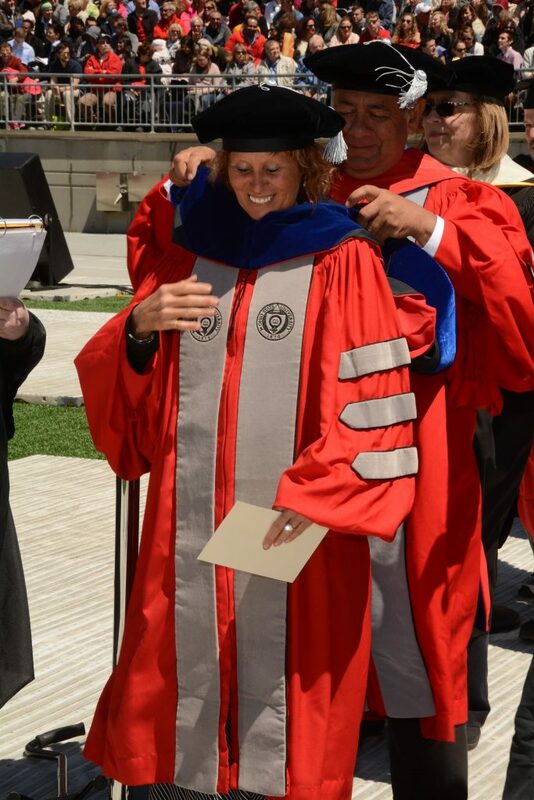 (At Ohio State, we have one ceremony per term and the university president presides over all those ceremonies throughout the year – that’s not typical, by the way). Don’t wait to be invited – find ways to take charge of your own career by getting involved and meeting people different than you. Find ways to really become self-aware of who you are. I credit my experiences at Ohio State in helping me do that and it wasn’t always easy. Balance your out-of-class learning with your in-class learning (both are valuable). And study abroad – I really have only one major regret and that was it. I had to wait years into my career to travel internationally. My engagement with ACEL has cultivated so much in me and continues to do so now that I’ve returned home. The overarching theme is that ACEL cultivated my potential, even when I didn’t think I could do any better. The surprising thing is that even as chair, I still feel like the department continues to push and invest in me even when I feel it’s my job to do that for others. 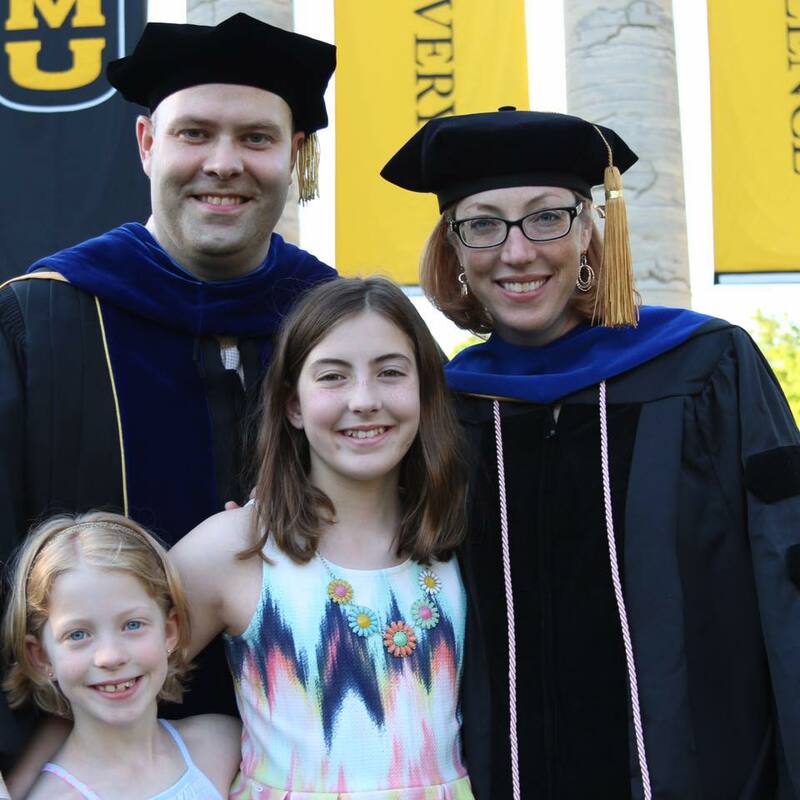 Kitchel’s family, following wife Laura’s graduation with her PhD from the University of Missouri. 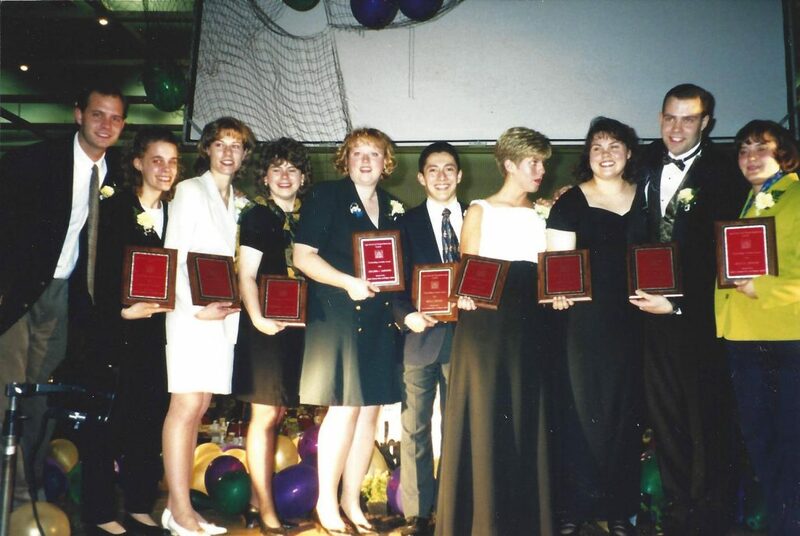 Kitchel (second from right) at the CFAES Recognition Program in 1998 with other “Top 10 Seniors”. Kitchel with advisor Dr. Jamie Cano. Speaking at a CFAES event as chair of ACEL. 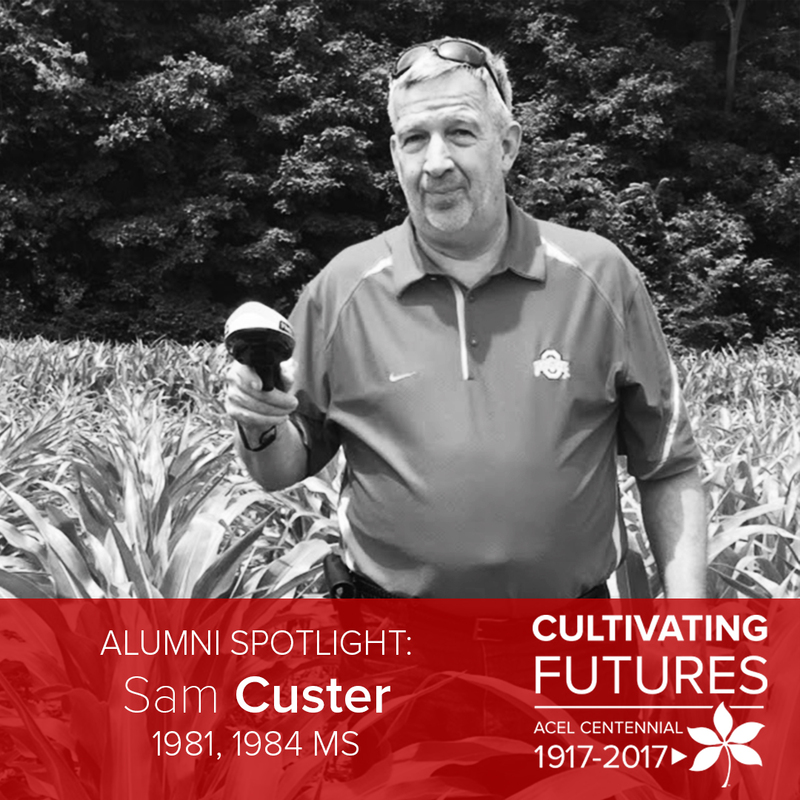 Sam Custer graduated from Ohio State with his undergraduate degree in agricultural education in 1981 and his masters in agricultural education in 1984. 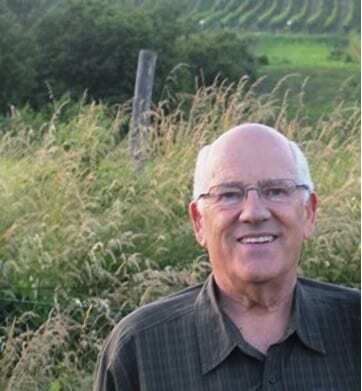 Shortly after graduation, he became a teacher of agricultural education at Versailles Exempted Village Schools. These days, Custer is an agriculture and natural resources educator for Ohio State Extension in Darke County. [ACEL]: Hi Sam! You majored in agricultural communication. What influenced you to choose that major? [Custer]: I chose agricultural education because of my two high school ag teachers. The late Bill Hershberger and Bill Klepinger. They have been a huge influence on my life. Bill Klepinger took me to Ohio State’s campus and we met with Dr. Jim Knight. There was not really any other thoughts about any other place. The plan was to always get my ag teaching license and to teach agriculture. I was in Agricultural Education Society, but was not as active as I should have been. I spent a lot of time working for Connie Rice and others in the Department of Agricultural Education office as a work study student and also participated in intramurals. What were some of your favorite classes? I really enjoyed all of my agricultural education classes but also got a lot out of the ag economics classes. What faculty or staff members had an impact on your education? There were many and it would not be fair to single any one person out. Dr. L.H. Newcomb, Dr. McCracken, Dr. Starling, Connie Rice and all of the Ph.D. candidates back in their office, especially Stacy Gartin. Dr. Newcomb and Dr. Plimpton’s classes. Master teachers in action. Throughout your career, what positions have you held? Please share any careers or honors you have received throughout your career. Making a difference in a person’s life, no matter if they are 16 of 61. What advice would you give to a current student studying agriscience education or extension education? Make the most of your college experience. Take advantage of the people you interact with to learn from them. The confidence to share the experiences I have had. [ACEL]: Hi Melanie! Why did you select agricultural communication as your major? [Wilt]: My high school biology teacher assigned a paper to write about a career in science and interview a professional in the field. My dad suggested I speak with his former fraternity brother (Tim Reeves, then editor of Ohio’s Country Journal). After an hour on the phone, I hung up and said “People really get paid to talk about farming?” My first agricultural communication class was awesome and I went back to the dorm every day chattering about what I learned to my roomies. It turned out to be exactly the right path for me! didn’t even apply anywhere else! Ohio State provided a ton of opportunities and a network I couldn’t have imagined being a kid from a high school graduating class of 57. It provided me a global perspective and built on a passion for agriculture that was there from a young age. The connections that I still have from OSU are now colleagues, clients, mentors and friends. How were you involved on campus as a student? The extracurricular activities I gleaned the most from were internships and work experiences, especially at the College of Food, Agricultural, and Environmental Science’s (CFAES) Department of Communications and Technology, where part of my job was to manage media for Farm Science Review. In addition, I was involved in Ag Communicators of Tomorrow and developed a national network in my industry, including a lifelong friend who was an ag comm major at Michigan State. I was a member of honoraries, such as Phalanx and Chimes. My favorite classes were of course the agricultural communication major classes, but I also learned a great deal from animal nutrition and a comparative politics class on central campus. That began the groundwork for my political career many years later! And, of course I’ve used the skills I learned in my food science wines class – both when I worked as chief of markets at ODA and as a hobby! Dr. Ann Hollifield was my freshman advisor and was only at Ohio State for a short time, but she had a tremendous impact on my excitement for the field of agricultural communication. She encouraged me to learn about broadcast journalism and to take a couple political science classes. While I didn’t pursue broadcasting beyond college, it certainly prepared me for a career in public relations. I was Media Relations Manager for the Ohio Florists’ Association, which is now AmericanHort. What different positions have you had throughout your career? AmericanHort (formerly OFA), Ohio Department of Agriculture (in several different roles), Avetec, Shift•ology Communication (formerly Wilt PR), and Clark County as an elected commissioner. Starting my own business took a lot of guts and some sleepless nights, but I’m so glad I took the risk. It has paid off and then some! It’s not about the money! Choose a career path that you love and are qualified for, and the rest will come together as you gain experience. You’ll be amazed what you can achieve in just a few short years in the “real world.” Oh, and do a volunteer internship – it could lead to your first paid internship. An appreciation for different perspectives and a means to channel my intense passion for agriculture into something productive and enjoyable.